Once upon a time there was a Golden Age in the theatre. Some were privileged to be a part of that incredible time. One such lucky person was Judith Drake. She began the international tour with Mary Martin in 1965-she played Ernestina Money-her contract was for 18 months, she believes…they opened in Minneapolis MN in April and played 11 other cities before going to Tokyo. Then it was Vietnam for two weeks, playing a different base every other day in airplane hangers, and a couple of shows in what was then Saigon. 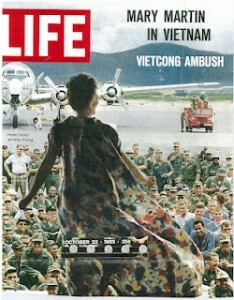 US Troops in Viet Nam got to see Dolly after it was snubbed by the Soviet Union. months (Mary and other stars for 10 months) after which she joined Betty Grable in Las Vegas to finish out her contract…a few months there and then some major cities. Then after her contract was over, she went back to New York. She believes it was 1968 when she was asked to replace Mary Jo Catlett (the original Ernestina Money) on Broadway with, at the time, Betty Grable, then on the nine months bus and truck tour with Dorothy Lamour. Those were her three Dollys-and she had a few weeks in the summer of 1970 with Marilyn Maye at the Kansas City Starlight theatre. Judith tells me that all of her Dollys were terrific. 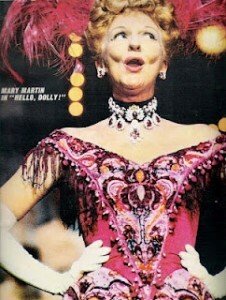 She learned more about stage work than you could any other way by watching Mary Martin nightly. Mary Martin knew where every light was, she never missed a show, even when she wasn’t feeling well, she signed her autograph for every person waiting at the stage door, and she was SO supportive of all of her cast members. She desired everyone around her to be great…during the first rehearsal of their opening number, Judith did a take to Mary, and Mary said, “Honey, do that to the audience”, as she turned her head to face the audience instead of her, “and you’ll get a laugh every show.” And she did! Several years later, Mary called Judith backstage on opening night of an off-Broadway play she was doing, from Texas, to tell her “to break a leg”. While all the Dollys were wonderful, Judith thinks Mary was the ONE who fitted in as an actor, rather than standing out as a movie star. Betty was very friendly. She even had us at her home in Vegas. Liberace was there. When they were in Chicago, Betty’s frequent Hollywood co-star, was there doing a show and gave an opening night party at his hotel room for them. Betty did miss a few shows. Dorothy Lamour was very nice as well, traveling with her husband by car. She was a very midwestern part of the company as opposed to playing the star. Judith says Gower was great. He was very open to taking chances, hiring Judith…a young kid who’d never been in a musical in her life, having just graduated from college and coming to New York only a few months before Gower saw her! He was a great director and allowed her to do things differently from the first Ernestina…as long as she was funny. He wasn’t afraid to let the actors channel the characters their own way. David Merrick came to several places during their tour…including NY run throughs. Judith doesn’t remember where, to tell you the truth, but she knows he was in Vietnam and remembers he was in London. She was too naive to be scared of him. He was also nice to her when she met him. For new kids, they all had a liking for Mr. Merrick.They had a same liking for everyone in the office. Everyone in the office knew Judith was a first-timer. And Mr. Merrick put up with Judith doing a lot of stuff. In London, they were not told until they all got there that they had to join the union there. Judith and others in the cast insisted that the company pay the dues for all the cast that were only staying three months (the chorus was three months, some of the “smaller parts” were six months, the others were ten months), and the company ended up paying the dues! Then when Judith was on the bus and truck tour, she was the Equity deputy, and one day they were a few hours from their destination when they hit the time limit for how long they could travel. She called New York and insisted they pay them to continue, or they wouldn’t get on the bus after lunch! And…they did. 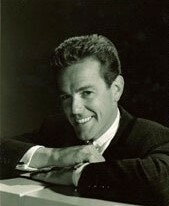 Gower was Judith’s friend Ron Young’s first show. He had graduated the year befor her. And when they were getting ready to do the second company, he told them that Judith was perfect for Ernestina, and talked Lucia Victor (Gower’s assistant) into seeing her, even though she was non-union, had never been in a musical, and had no professional experience. Lucia saw Judith and then talked Gower into seeing her. Again, Judith was too naive to know she couldn’t sing, so she just belted out a song, read the scene, and when she saw Gower coming down to the stage, turned and asked, “That what ya want?”. He laughed, and obviously liked her. She got a call later that he did indeed like her, but because she had no experience they were seeing other people before they decided. Then they called and said, “You have it.” Her Equity dues were paid out of her first salary, and she was on her way. Judith still remembers her opening night in Minneapolis…staring at the poster outside with her name on it! The show itself is a bit of a fog…but she does remember getting her laughs!! And taking her first bow in front of a huge audience!!! 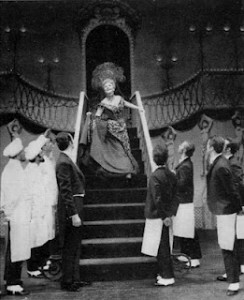 And of course her first night on the Drury Lane stage…hard to ignore the history associated with that place…She was trodding the same boards and a century of wonderful actors…there was a story about the playwright Richard Sheridan being locked in the dressing room (Mary Martin’s dressing room) to force him to finish a play! The theatre gave Judith a program from July, 1835 when she left…it’s in a frame on her wall right now. And then there was her first night on a Broadway stage at the St. James Theatre…she couldn’t believe it! Had to keep pinching herself! When Judith went into the show, she had about 4 weeks of rehearsals in NY. Their company finished totally in London, first the chorus was replaced with English singers/dancers after three months, then Judith and a few others after six, then Mary and the stars after ten. Betty had been in Vegas for several months before Judith joined them, then they were on the road for a few months, and then Betty went on Broadway a little while after the tour ended. Judith’s closing night in London was sad, as she had to say goodbye to her company…Mary gave her a lovely antique coin purse with Dolly etched on the front and a little piece of crochetted on the inside that she had done with her character’s name. Judith doesn’t recall her closing nights with Betty and Dorothy…just that while it was sad to say goodbye, it was exciting to look towards the future. A favorite memory that Judith has of the bus and truck tour. Missy traveled with them and it was a great trip for Judith and Missy. 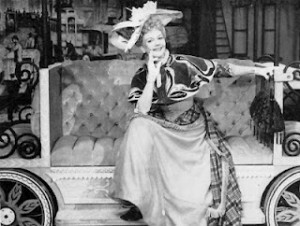 The musicians would keep her during lunch stops, and frequently there would be a knock at Judith’s hotel door and cast members would ask if Missy could go out and play. Judith said she learned from Dolly how to be totally involved with her fellow actors, how to project to the furthest seat in the balcony, how to love what you’re doing! This was the one and only musical Judith was ever in…She moved on to comedy/drama/straight shows. Mary’s example has always followed her. Judith’s worst experience was when President Johnson came to see the show in Dallas and without her knowing it, the secret service removed her shotgun from stage right ( In the opening number, I Put My Hand In, she gives a shotgun to Dolly who points it at a couple forcing the guy to take the girl) , so Judith gets set for her entrance…no shotgun! She goes out holding a pretend shotgun, her eyes saying to Mary, “I have no idea where the gun is”…and it turned into a fun moment, as Mary immediately realized what had happened, took the imaginary gun from Judith, aimed it at the couple and shot. Judith has loved all of the Dollys she has worked with or seen, but she loves Mary’s best. The WORST major change that Judith has seen in this industry since doing Hello, Dolly! is that people don’t know how to project anymore. She says if she sees one more microphone is someone’s face, she’ll throw up. I’m with her all the way. 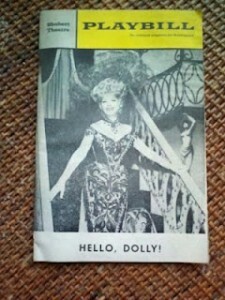 In addition to the Dollys that Judith has appeared with, she also saw Carol Channing, Ethel Merman, Pearl Bailey, and Ginger Rogers. Ethel Merman was Ethel Merman! Of course, Carol made Dolly hers.She said it was great to see Pearl Bailey. Great to see a film star like Ginger Rogers. Marilyn Maye, being such a great singer, was quite good too!